Ultrasound Specialist appointments now available at the Brompton Vet Clinic. Dr Livia Benigni an RCVS and EBVS recognised pecialist in Veterinary Diagnostic imaging is now doing an ultrasound referral clinic with us every two weeks. Please speak to one of our vets if you would like to know more about this specialist referral service for ultrasound diagnosis. An outbreak of the extremely serious disease Babesia, in Essex, is of particular concern to all dog owners. Babesia Canis is a parasite carried by ticks and is prevalent in Europe. Babesia is not believed to have been contracted in the UK before. Symptoms of Babesia include weakness, lethargy, fever, anaemia and red urine. We are advising that all dog are treated for ticks now that spring is here. Please call the clinic for advice. Identity Microchips is now compulsory for all dogs over 8 weeks of age in the UK. Most of our dogs and all dogs with passports will already be microchipped but if your dog has never been chipped you wil need to come in and get one implanted. It is very straightforward and only takes a few minutes. Although the change in weather means that ticks are not such a problem as in the summer, the prevelance of urban foxes in central London means that we do need to continue some parasite control in dogs to prevent them catching fox mange, a very itchy skin parasite. Foxes tend to come into the garden at this time of year and dogs love rubbing themselves on the ground where foxes have lain, which is how mange parasite is transmitted. Preventative treatment is easy with a regular spot-on drop such as Advocate or Stronghold and is strongly recommended. Advocate also has the advantage of contolling Lungworm, a nasty parasite that lives in the lungs and is transmitted by snails in the garden. Please note that the old blue UK Pet Passports require the Official Veterinarian stamp on the rabies vaccination page whilst the new UK Pet Passports require a practice stamp with the address and telephone number as well. If you are in any doubt at all please pop into the clinic and get the receptionist to check the rabies page. Since 2012, when travelling with your pet within the EU and qualifying countries such USA, Canada, UAE and Russia, a Rabies blood test has not been required. However, many pets have already passed the Rabies blood test and owners have assumed that they are thus eligible to travel worldwide outside the qualifying countries. This is only the case if the Rabies blood test has been taken 30 days or more after a Rabies vaccination and the UK border agency appears to be checking this requirement specifically. If you intend to travel to non-qualifying countries, please ask Kevin himself to check your passport before making any travel plans, even if you have previously travelled outside the EU. We are now able to offer dog bathing in our grooming area. 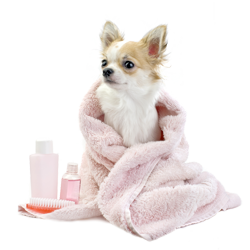 We have a purpose designed deep bath for pets and can offer a warm shampoo with deliciously scented honey and oatmeal shampoo followed by a trim and clip nails if required and blow-dry. Holidaying in Spain and Southern France? There is a new vaccine for the mosquito-borne disease Leishmaniasis which is present in the Southern Mediterranean, especially Spain but also the South of France, Italy and Greece. This is a particularly unpleasant canine disease which is difficult to treat and often fatal. Previously we have been advising the use of Scalibor collars for dogs but in addition we now advise the vaccine as well for all dogs travelling to affected areas. It is not present in the UK and thus is not part of our routine annual preventative vaccination programme. Please contact the clinic to discuss further if required. We are delighted that the clinic and its facilities have been awarded silver standard Cat Friendly Clinic status from the International Society of Feline Medicine (ISFM). This means that the Brompton Veterinary Clinic has achieved the numerous requirements of design, equipment and the level of care and special understanding for cats and their needs. For more information on the award and what this means please click on the cat friendly clinic logo on the right and you will be directed to the ISFM / international cat care website.